TAMPA, FLA. • Since relocating to St. Louis in 1995, the Rams haven’t been known for stellar tight end play in the passing game. In that 1995 season, Troy Drayton’s 47 catches for 458 yards have stood as highs at that position for the Rams in St. Louis. With 39 catches and just one game left this season, second-year man Lance Kendricks probably won’t get to Drayton’s 47 catches. But thanks to his 80-yard TD catch Sunday to open the third quarter — the longest reception by a tight end in franchise history — Kendricks has overtaken Drayton in yards. 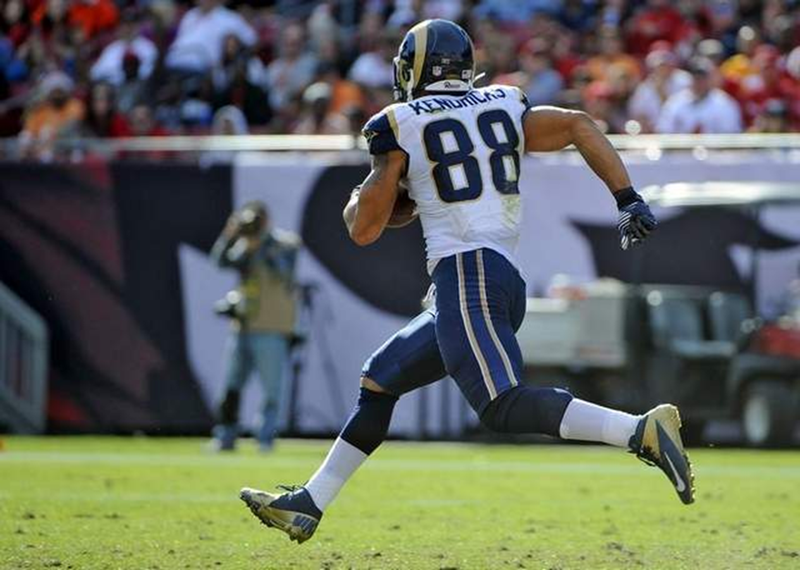 With four catches for a career-high 119 yards Sunday’s in the Rams’ 28-13 victory over Tampa Bay, Kendricks has 486 yards receiving this season. “He’s such a good player,” Rams defensive end Chris Long said. “I’ve really enjoyed watching him get better, just continue to work. I know there’s been some adversity, and he just has ignored some of the negative energy (i.e. criticism) he’s gotten. And he’s just turned it into a positive. Although he has kept playing, Kendricks has been slowed by a knee injury since the Nov. 18 loss to the New York Jets. He also took a shot to the hip while blocking on Steven Jackson’s 5-yard touchdown run in the second quarter against Tampa, further limiting his mobility. Nonetheless, he got no mercy from his teammates after a lumbering finish to the TD. “I saw the piano jump on his back at like the 20,” Long chuckled. Quarterback Sam Bradford jumped on the pile as well. “I went over to him on the bench and I think he needed some oxygen afterwards,” Bradford said. Kendricks was so much in the clear for most of the run, it was almost as if he wondered — Where is everybody? “After about 40 yards, I was gassed,” Kendricks confessed.